New in the library’s Overdrive collection are digital audio and text versions of Paradise Lost. A print copy is at the physical library (Call number 821 M64PZP, main floor) and an eBook version from library eBook vendor, Ebsco, is also available. Looking for some critical analysis or biography? You might try the eLiterature collection in the library’s collection of digital titles from Salem Press, also, the Biography Resource Center. The library is pleased to announce its new partnership with eContent vendor Overdrive. 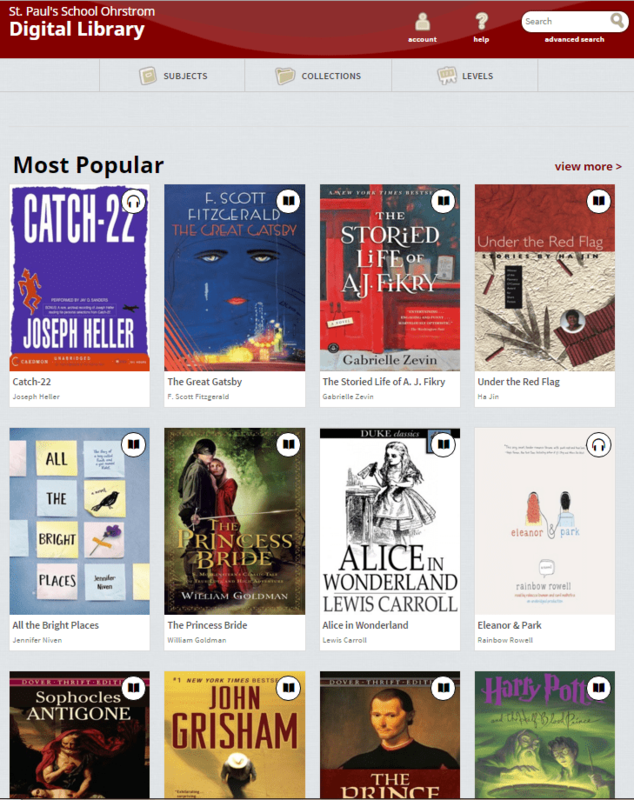 Popular fiction and non-fiction eBooks and Audiobooks. The inaugural collection of roughly 100 titles includes core Humanities texts and popular YA fiction in audio and eBook form. To borrow Overdrive content simply log in to the SPS Overdrive site using your existing SPS username and password. Overdrive offers a 2-minute video overview HERE. Just like the print collection over in the library building, the Overdrive collection is built title-by-title. And, just like the print books, most titles in Overdrive are available on a one-book-one-user basis. Never fear, it’s easy to place a hold and the library is always open to the idea of purchasing additional copies of popular content. Is there an app? What if I’m off the grounds? Yes! There is an app which can be used for off (or on) the grounds access. One can also access the SPS Overdrive site from anywhere with an internet connection and log in with one’s SPS username and password for complete access. SPS Overdrive Landing Page. Overdrive. Web. 20. Nov. 2015.